Lead guide Jaime Avila and Scott Ullem standing on the summit of Cotopaxi (19,347′ / 5897m) shortly after the team topped out. All the hard work of training and pre-acclimatizing paid off as this was only Scott’s third morning spent in Ecuador. Incredible effort! 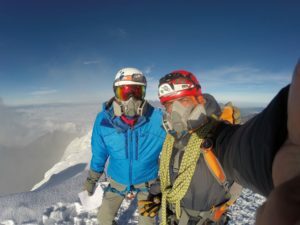 It’s definitely unique to see climbers with respirators on the summit of Cotopaxi, but the sulfurous fumes coming from the caldera make them a necessary piece of gear to stay strong and healthy for the descent. Not to mention it makes for a cool photo! Cotopaxi is the world’s highest active volcano, and the second highest point in Ecuador. From the summit you can enjoy an incredible view of the Cordillera Blanca and Quito in the distance. Cotopaxi is still active and the latest eruption lasted from August 2015 to January 2016. Due to the recent eruptions, Cotopaxi had been officially closed for climbing by authorities, and just reopened for climbing in September 2017. For any questions on our expeditions or courses please contact us at info@alpenglowexpeditions.com and 877-873-5376.